Illness happens to all of us, no matter our best intentions, right? You can get rest, take all the Echinacea in the world, or follow the directions laid out in this article to help prevent illness in the first place...but sometimes, a bug just gets going in your system. And BAM! Suddenly, you know if you don't do something right away, some real misery is right around the corner! If you do happen to pick up a cold or flu, there are some natural things you can do right away, including herbs you can take (like Elderberry Syrup), to stop that cold or flu FAST. You can actually shorten the duration of illness and keep it from getting a good hold on your body by doing these natural things! I'll be discussing some powerful immune boosting strategies along with sharing a recipe or two--these are things Mr. V. and I do right away if we feel like we are catching a cold or flu. How to Recover Quickly and STAY Recovered. FTC Disclosure: There are affiliate links scattered throughout this article. If you click through and make any kind of purchase, I may receive a very small commission at no extra cost to you. How to Get Well Faster or Keep a Cold from Getting Hold of You...Naturally! There are many herbs that boast immune-boosting powers out there, and some of these are probably even in your kitchen! I'll be sharing my favorites with you, starting with my Number 1: Elder Berry and Elder Flower. I remember gathering elderberries with my family every Labor Day weekend as the school year began. We made jam and jelly with it! We still love gathering the berries and making jams, but there is so much more to elder than jam! Do you know where I first learned about the medicinal powers of elderberry? From Rosemary Gladstar in a course I took many many years ago, and before that, from her book, Medicinal Herbs: A Beginner's Guide. This is a fabulous resource every family should have, and it comes highly recommended not only by me but by many exceptional herbalists! These are two extremely useful parts of the Elder Tree--or bush, in many cases (Sambucus nigra). These are the berries and the flowers. You can use either to help boost your immune system. In fact, Mr. V. and I use Elder Flower tincture when we feel something coming on. However, the beautiful, purple (or blue) and very tasty Elderberry is the focus of this post. Elderberry has some amazing immune boosting benefits! There's actually a fairly well-known OTC drug (which I don't recommend using--but we'll discuss that in a later article) called Sambucus, and yes, it is a highly adulterated, sugar and chemical-laden elderberry syrup that folks are starting to learn about. 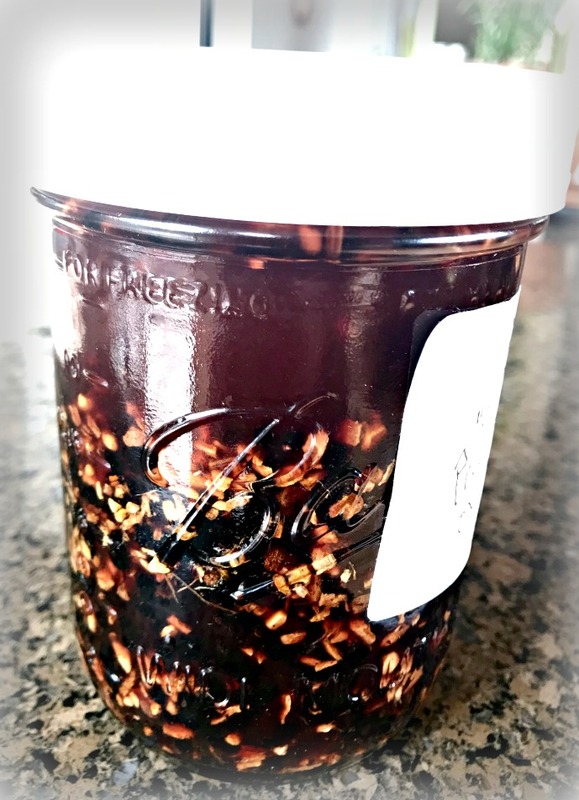 However, I'll be sharing my recipe for REAL Elderberry Syrup recipe that's easy for you to make yourself and is much healthier! It's an incredible effective immune booster. But first, why does Elderberry (and Elder Flower to a lesser extent) work to support your immune health? How does it help your body fight off a cold or flu? Well, it has to do with the immune-modulating quality of elder berry. In simple terms, the compounds in Elderberry take over where the bacteria or virus wants to be in your body. The compounds contained in elder berry also stop viruses from reproducing! That's a very simplified explanation of how it works, but in a nutshell, that's what you need to know. Here are some articles about the science behind the action Elderberry has on our bodies: https://www.ncbi.nlm.nih.gov/pmc/articles/PMC4848651/, https://www.ncbi.nlm.nih.gov/pmc/articles/PMC3056848/. There is more information about elderberry on the government's National Institute of Health website, in case you are interested. Because of this action on the human body, Elder Berry can cut the onset of a cold or flu right off at the pass...or, if one does get started, using Elder Berry will significantly shorten the duration of the illness. Here are dried elderberries! They are ready to go into a new Oxymel...ready in about four weeks, using the slow method. Hopefully, I won't need it, but I'll be using it anyway because it's just pretty darn delicious! What is an oxymel, you wonder? An oxymel is an herbal formulation made with a base of honey and vinegar, giving it a sweet/sour taste. Along with the healing properties intrinsic in the honey and vinegar, you add herbs of choice to make this type of syrup super powerful. You can also make a typical syrup without the vinegar, but I think the vinegar gives it an extra nice kick and also contains health benefits. This is just one way to make an Elderberry syrup, and I'll be sharing that recipe on the website soon! This oxymel is super easy, though, and it's a good one to make ahead and have on hand in your refrigerator! You can use either a quart jar or a pint jar. If you haven't tried an oxymel before, you might want to start out with a pint to be sure you like it and will use it. You can always make more very easily. 1) Fill your jar about half full of dried elderberries. 5) Fill the jar to within an inch with approximate equal measures of honey and apple cider vinegar. And, if you prefer sweetness, you can add a little bit more honey than vinegar. Making an oxymel is a pretty flexible and forgiving business. Honey is incredibly soothing on a sore throat too, and may help your child want to take his spoonful! 5a) The Fast Method: You can now either warm your mixture slowly in a double boiler for a few hours, adding more vinegar as needed. You'll know it's ready when the elderberries look a little "used up." Be sure not to let the water run dry in your double boiler. 5b) My preferred (Slow Method): If you can wait a bit, just take your jar, put a plastic lid on it (you can buy plastic Mason jar lids in your canning section in the grocer's or on Amazon), and allow it to sit in a sunny window for about four weeks. Shake or stir it gently daily or at least a few times a week to keep things mixed up. **The reason you want to use a plastic lid is because the vinegar corrodes the metal on a typical Mason Jar lid. If you don't want to get plastic lids, then just put a piece of cloth, or even paper towel, between the glass rim of the jar and the lid. 6) When the syrup is ready, just strain off the plant matter (the marc), bottle up the syrup, and store it in the refrigerator. The recommended time to use it is six months or so, but I have used elderberry syrup I've had in the refrigerator for over a year with no ill effects. Just be sure to do the "smell/taste" test to be sure it's not "off" if it's been over a few months. Here are the ingredients in a pint jar. Note the plastic lid! You don't want the vinegar to mess up a metal lid, causing a yucky tasting product. Vinegar corrodes metal, so always keep them separate! You might be interested in this complete Cold & Flu Care eBook! It's 65 pages of remedies and herbal information to keep you well and get better faster! Take 1 to 2 tablespoons per day when you feel rundown. If you get an illness going, you can take an additional 1 to 2 tablespoons. Contraindications: Elderberry is considered safe, but eating too many raw berries can potentially cause nausea. You'd have to eat a lot, though. Too many of the flowers can have a laxative effective. I’ve never heard of anyone becoming ill from an oxymel because the plant matter is strained out before use. Yep--You can add elderberries to your herbal teas! If using dried elderberries, simmer them for about 20 minutes. They are actually delicious, and teas are a great way to get the benefits of elderberry. Be sure to strain out all plant matter. How About an Elderberry Tincture? Yep! Read my article on how to make a tincture. If you decide to make an elderberry tincture, just use a mortar and pestle to lightly crush them first. You can also add elder flowers to your tincture. Mr. V. and I actually use a tincture of only Elder flowers, and that works great for us! With elderberries, be sure to strain out all the plant matter before using. I love garlic! It has anti-microbial properties that can really stop a cold or flu right away. It's not as pleasant to take, though. For us, the best way to use garlic is to cook with it....a LOT! You can also add it to honey for a sweet-garlicky taste. Just take a few spoon fulls throughout the day. Or, just pop a garlic clove into your mouth once in awhile. When Garlic is ripening at harvest time, I skin tons of cloves and put them in vinegar in the fridge in a very large jar. These are delicious to eat by themselves and especially to cook with! I don't even know how long they'll keep because they are gone before they've ever turned. This is something I do when I'm just catching something, but also if I end up fully ill. Steam helps open nasal passages and reduce inflammation temporarily. Steam helps warm you up and clears your head. You can just take a hot pan of water, hold your face over it with a towel gently covering your head, and breathe in the steam deeply. If you want an extra powerful steam experience, then use a couple drops of Eucalyptus and Peppermint Essential oils. If you don't want to deal with the pan, then this works as well in the shower. I'll often drop a few drops of essential oil outside the path of the water, and the heat will release the sinus opening and soothing effects of the essential oils! Pretty much everyone knows about the power of Echinacea these days. That's because it works. You can buy OTC preparations in capsules from a good health food store, or you can buy the bulk herb and add the dried pieces to your teas. Seriously, rest is the best way your body has to heal itself. Often, if you are feeling like you are on the edge of getting ill, just taking a day to relax is the best thing you can do for yourself! You’ll love this complete guide to natural and gentle cold and flu care! This is a digital eBook you can download and use right away. Final Thoughts on Natural Ways to Shut Down a Cold/Flu and Stop It in Its Tracks! When you feel like you're just starting to come down with something, even after you've done all the things to prevent an illness in the first place, trying some or all of these strategies may just take care of that pesty cold or flu before it can really ever get going all the way and become truly miserable. Stay tuned! In addition to my articles on how to make a natural decongestant and how to unstuff a stuffy nose and get rid of congestion, I'll be writing more on this subject in the next couple weeks! If that cold has already gotten hold, and you're a little late reading this, here is my article on how to make a natural vapor rub salve that really works! It's one Mr. V. and I have been using for years! If you are interested in learning more about making herbal medicine and how plants can change your health and life, I have taken several courses at the Herbal Academy of New England. It's a great school with some wonderful teachers who know what they are talking about. There is truly a course for you at HANE, at all levels and interests! What other kinds of natural things do you do in your family to take care of that little itchy feeling you get when a cold is just creeping up on you? Leave comments! We love to hear your thoughts! P.S. If you haven't done so yet, please sign up for our newsletter! It's free, plus you'll get immediate access to the password protected Resource Library where you can find great downloadables like this eBook, How to Relax using Herbs. Disclaimer: I am not a medical doctor. The statements made in this article, elsewhere on my website, and in any publication I write are simply personal opinions based on experience and study and are for informational purposes only. In no manner, stated or implied, is any of this information meant to cure, diagnose, treat, or prevent any illness or disease. Please seek advice from a medical professional. These statements have not been evaluated by the FDA.